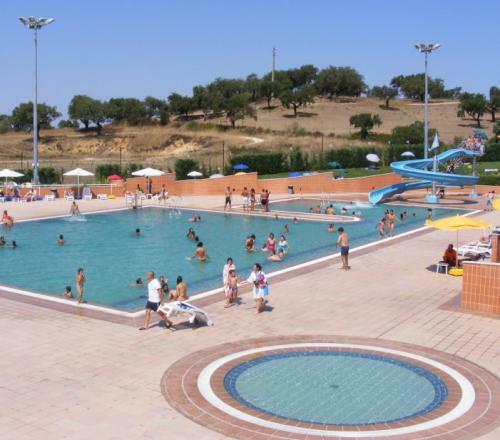 The Parque Aquático do Crato is located in the town of Crato, Alentejo in central Portugal. The park forms part of an entertainment and leisure complex with water slides, pools, leisure areas, restaurant and a large entertainment stage. The park is highly popular during the summer months with locals and tourists seeking a place to relax and have fun in the sun, as well as with family groups. For guests looking for adrenalin-pumping kamikaze rides and high-speed descents this water park may disappoint. Its charm, however, is in its variety and family atmosphere. There is one main water slide which is highly popular, set amongst several leisure pools and plenty of wide open spaces for relaxing in the sun on a lounger or under the shade of a sun umbrella. The main pool is spacious and suitable for leisure swims or lengths and is fitted with a hydraulic lifting chair for the disabled. 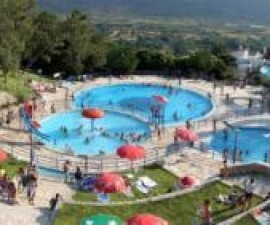 There is an additional circular training pool to its side, which is very popular with families, along with two dedicated children´s pools. In front of the large terraced area is the diving pool, which provides hours of fun for divers and spectators alike. Consisting of 3 fixed high boards and 2 springboards, it is one of the best facilities of its kind in the area and is a generously-sized 14×14 metres and 3 metres deep. All the pools are fitted with new technology, which reduces their chlorine content by over 60%. 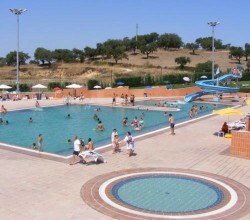 The facilities at the Parque Aquático do Crato are extensive. Spacious changing areas are well stocked with plenty of hair driers and individual showers, four of which are specifically adapted for wheelchair users. One of the park´s main draws is its excellent restaurant, which operates daily during park opening hours from 10am until 7pm. Here guests can enjoy lunch, dinner, snacks and drinks throughout the day to keep up their energy levels. The restaurant is a spacious 180 metres and has capacity for 400 diners, either in a single room or divided into two separate, sound-proofed areas, and is available for private event hire until 11pm. 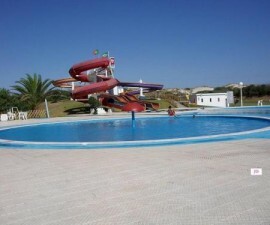 The Parque Aquático do Crato is located in a beautiful area in the heart of the picturesque Alto Alentejo. Taking time out to explore the region is well worth the trouble so if you have time why not stop at Portalegre or the historic city of Elvas near the Guadiana River, close to the Spanish border at Badajoz.